This is the time of year when all the new camera models are announced. In the run up to Photokina (giant photo show in Germany), most of the manufacturers are pre-announcing their new products. 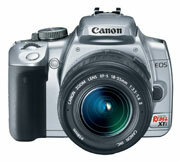 Canon has released info on the next Digital Rebel model - the Canon Digital Rebel XTi. The XTi is an update of the popular Rebel XT. Canon has bumped the resolution up to 10.1 megapixels (from 8.0 in the XT) and increased the size of the LCD screen to 2.5 inches (up from 1.8 inches on the XT). Canon has also added an integrated sensor cleaning system that incorporates an ultrasonic self-cleaning mode for removing dust particles from the sensor. This prevents "spots" showing up in your photos caused by dust sitting in front of the image sensor. Also announced was the new Nikon D80. 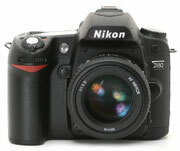 Nikon has essentially created a bridge camera between the popular D70s and D200 cameras. The D80 is slightly smaller and lighter than the D70s but features the same 10 megapixel sensor that the D200 uses. Nikon also bumped up the LCD screen size (2.0" to 2.5") and resolution (130,000 pixels to 230,000 pixels). G6 will be a 10 megapixel camera with a 6x optical zoom lens (35-210mm equiv.). When combined with our closeup attachment kit, this lens should allow you to photograph an area approimately 3/4" wide. We will know more after the camera is released and we can thoroughly test it. PhotoMed is happy to announce the addition of the ClearMatch Shade Matching system to our product line. ClearMatch® is a shade analysis and communication tool for dentists and dental laboratories. It is a software-only system that allows the user to select the digital camera of their choosing and use their existing PC to perform highly accurate analysis of shade, value and anatomical features of teeth. Detailed shade and value maps can be generated from the images of digital cameras and can then be sent with the original images to your lab. Use your digital camera and ClearMatch® to improve communication with your laboratory, improve patient satifaction and increase your profitability. Our Canon CP-400 Dye-Sub Printer is on special during the month of September. The CP-400 is a 4"x6" dye sublimation digital photo printer that gives you archival quality prints that rival 35mm prints. You can print from any printer or directly from digital cameras that are PictBridge compatible (most Canon camera and newer camera from other manufacturers). Mention the September CP-400 Special and receive 3 free print packs with your printer order. That's a $42 savings and represents your first 108 prints! The ADA in Las Vegas is coming up! For the first time in many years, the ADA Annual Session will be held in Las Vegas. Plan on visiting us in booth #20056. We'll have all the new cameras so you can get your hands on them and try them out. Is there a product that you would like to to carry or a service that you think we should offer? Let us know! We are always looking for new ways to help our doctors.